What do hives look like? Actually there are a number of different types, which is also called urticaria. Take a look at our hives photos and discover some new natural treatment options you might not have considered. It is not uncommon when a rash breaks out on our skin for people to tell us "it's just the hives", but what do they look like? How do we know if the rash we have is really urticaria, especially when there are so many different kinds? How do we discover what caused it? Or what we should do about it? What is Urticaria or Hives? They can appear in all kinds of ways, as a result of an allergic reaction to something you may have eaten, inhaled or brushed against your skin. This is your body's way of fighting back against the irritant and appears as a very itchy rash. The rash appears quickly and disappears just as fast, usually within 24 hours. The skin rashes do not always appear in the same spot and a breakout is not, in most cases, a serious condition. It can, however, be very annoying and worth finding out what is causing them. 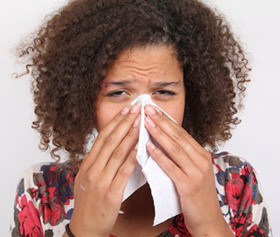 On rare occasions urticaria can create breathing problems, depending on the severity of the allergic reaction and medical treatment should be sought immediately. What do hives look like? 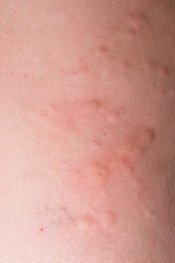 In most cases they appear as small, red, itchy welts that look like mosquito bites. They are slightly raised with flat tops and can vary in size. See some hives photos, and for some of the medical details of all the range of possible types of outbreaks, visit DermNet. Urticaria can be very small or large enough to cover a large area of your body. In most cases the rash will disappear quickly. If they keep reappearing, it is time to consult with a physician or a natural health practitioner, and try to find out what is causing it. What Happens When You Get a Breakout? 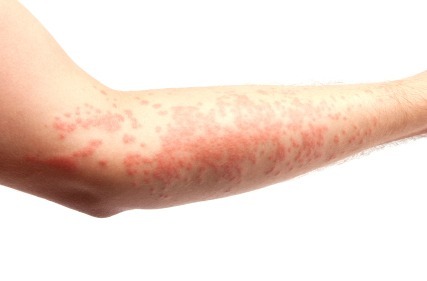 An urticaria rash can be extremely itchy and annoying! They often arise completely out of the blue and can, therefore, be a very unsettling experience. The first break out may be frightening as well! If you are prone to skin rashes you may find the breakout uncomfortable and embarrassing. You just want your red, itchy, blotchy skin to go away! Their presence causes stress and stress only aggravates the rash. 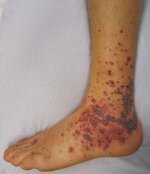 There are things you can do to prevent and treat uriticaria kin rashes. Once you have the answer to "what do hives look like?" you are on your way to doing what you can to prevent future breakouts. The best treatment is to discover your what causes your hives, and to eliminate those irritants from your daily life. In many cases you may not be able to figure it out right away. This skin condition is often caused by food allergies. Determining what food it is may be a bit difficult but by using a process of elimination diet you can often discover what it is. You can have tests done but they are often expensive and time consuming so if you can figure out the cause yourself it will save you money. A breakout can also be caused by medications. If you recently started a new medication, ask your doctor if there is another option. Other culprits are infections, insect bites, exposure to extreme temperatures, hot or cold, chemicals, food additives, cleaning products, cosmetics and even hot water. Even stress can bring on an outbreak of hives! Learn more about what can cause urticaria. When you answer the question, "what do hives look like?" 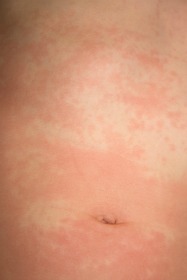 then you can decide whether or not your rash may be this, or whether you may need to see your doctor. While you are investigating possible causes, there are a few things you can do to be more comfortable and to help your body clear up the rash on its own. Treat the rash with cold compresses to relieve the itching. Take an oatmeal bath to reduce the redness and soothe your skin. Drink plenty of pure water to help your body eliminate the allergens and irritants from your system. Eliminate toxins from your environment, your body and your skin care and personal care products. My free eBook Clear Any Skin Problem Naturally has a simple, five step program to help you to detoxify and clear your skin. One of the challenges of having sensitive skin is that sometimes the medication you take to get rid of the rash can actually make the problem worse! Each of us has a unique body and what works for one person may simply not work for another. If you've tried home remedies and other natural treatments and you are still plagued by breakouts, you may want to try natural or homeopathic hives treatments. 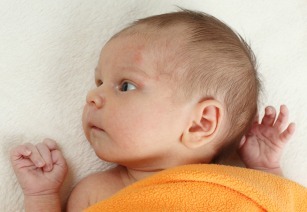 Homeopathic remedies can be a great solution for those of us with sensitive skin. Why? They help the body to clear up the skin rash without the side effects often encountered by using medicines or even herbal remedies. If the remedy doesn't work for you, the worse thing that happens is that you return it for a refund. This is a gentler and safer approach for those of us that tend to have bad reactions to medicines or even herbal remedies. One of the best homeopathic remedies I've seen for urticaria rashes is Hive Away which acts quickly to stop the redness and itching, and is safe enough even for pregnant and nursing mothers. What if you keep getting hives over and over again? You get rid of them for a while, and then they return. Yikes! It's bad enough to be embarrassed by an outbreak even once! Then, after a few more breakouts you begin to absolutely dread it! I really understand. In the case of chronic idopathic urticaria (which is the medical name for this) you end up feeling really desperate ... you never, ever want to know what do hives look like again! The problem with many medical treatments for hives is that they work for a while but they don't address the underlying cause of the hives. If your medical treatments don't work and you keep getting terrible hives over and over again, here are some other options that may help you find a solution. See a natural health practitioner such as an acupuncturist, naturopathic physician or holistic medical doctor. Acupuncture especially has a good track record of being able to help some chronic skin conditions. Try a self help natural hives treatment program which is designed to reduce or eliminate the major causes of hives in your daily life. The one I like the best is Urticaria Solution which was created by Nancy Summers who healed herself from several decades of suffering from chronic, recurring hives.